In the sea of real time strategy games, Spacecom branches itself from the rest by sticking to one theme, depth with simplicity. Spacecom’s lonely atmospheric indie galaxy experience offers more than what most would come to expect in a 2-dimensional strategy game. 11 bit studios and Flow Combine’s Spacecom is an absolute example of a great game not being reliant on great graphics. Behind its simple user interface hides a system of mechanical strategic depth that not many games can seem to match, despite their higher development budgets and massive art teams. Within the world of Spacecom you are a space commander taking control of a small fleet of ships and sectors within space that will have you carefully planning each step of your star trek. Each match will have you controlling multiple ships that consist of three different types: battleships, invasion, and siege. Battle ships are self-explanatory and best in combat situations for obvious reasons. Invasion ships are used to take control of sectors that will allow you to increase your resource acquisition, repair your fleet and construct new ships for your fleet. Siege ships destroy sectors, denying them to your opponents but also removing them for your use as well. Every choice you make in Spacecom is crucial towards building into a cunning victory with one wrong move possibly resulting in a devastating defeat. Not only do players control ships within Spacecom, but they must also manage each sector. Sectors can be fortified with kinetic shields that will withstand attacks for a period of time or battle stations that can defend the sector from attacking units. Each sector will also need to be invaded by invasion ships first to be acquired and then later grounded to finally take advantage of their perks such as extra resources or repairing stations. All of this must be managed while also trying to attack or fend off enemy players or AI. It might seem complex and overwhelming at first but soon it all falls into place in a very simple yet rhythmic way. The end result is a title that eases players in gently, but offers plenty of areas for intense mastery to make the most of your choices and assure victory more often. Spacecom offers a small campaign of 13 missions each with side objectives which in total equal 31 optional missions that will have players replaying missions to complete these sometimes challenging optional objectives. The campaign serves as more or less a tutorial for players getting their feet wet with Spacecom as the campaign will take roughly 5 hours to complete or less depending on their skill level as well as number of side objectives they choose to complete. 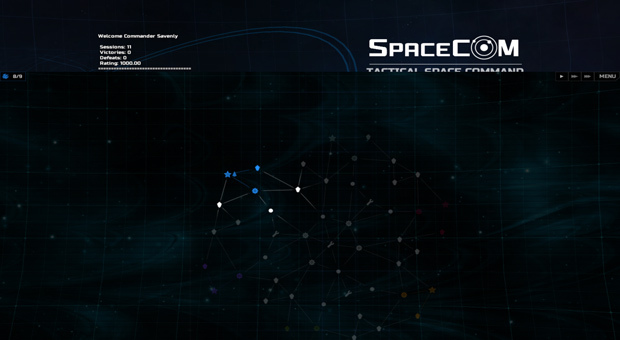 Spacecom also offers online multiplayer as well as a skirmish mode that can have 6 factions fighting against each other in an all-out battle of wits. This is where Spacecom shines as each match can be tuned to different difficulties, color representations of opponents, and galaxy sizes. Expect to spend hours upon hours within skirmishes fighting AI opponents tuning your skills and ultimately your critical thinking. Spacecom’s multiplayer options were plentiful. Players can choose from player made lobbies that allow players to change cluster size, check ratings of other players and even add AI opponents to matches. Cluster sizes can range from having up to 6 players playing within a match to as few as 2. The size of the cluster will factor in how long it takes to complete a match or even how difficult it can be. Each match that you play will earn you experience towards your next ranking and will have you climbing the leaderboards towards the top. Your own statistics can also be seen within the main menu checking your own ranking as well as your friends. The sound within Spacecom never grained on its gameplay unlike some real time strategy games. Moving units around the map will seldom feel like a chore as clicking within sectors and space will make the appropriate beep and blip as you explore space. Battles that break out within games will also make a tense sound that will alert you to when you’re being attacked as well as alert you when enemy units are moving so you can prepare your next move. 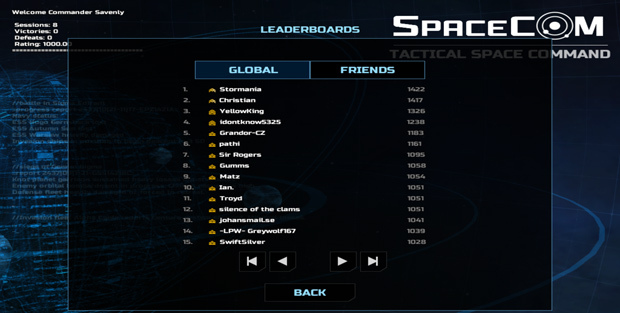 The few music tracks played in Spacecom are appropriate and are even catchy when playing during the right mood. Space battles can seem quiet at first but it gives the feel of the starry emptiness of space that your fleet is being commanded in and overall adds a sense of atmosphere when controlling your ships. Graphics within Spacecom are not its selling point. Everything is very simple right down to its gameplay, and it’s meant to be this way. Ships are represented by triangular sprites that are differentiated with stripes across certain parts of its body to represent what type of fleet it is. 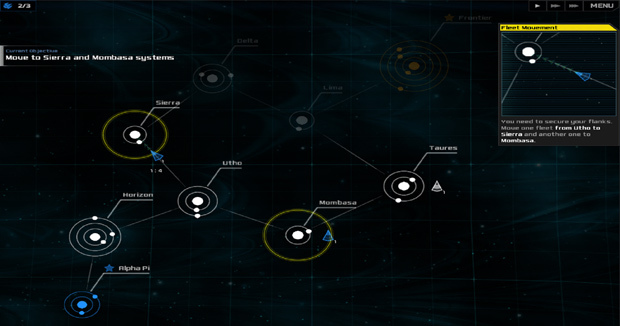 Clusters (Game Maps) will show systems represented by simple circles and rings to show captured or uncaptured territory as well as icons to represent system perks. Graphically the game is extremely simple but it works for what it attempts to accomplish, a deep yet simple space real time strategy game. If there was ever a time to revisit the starry skies, Spacecom encourages you to take its simplistic nature to heart and break out your thinking cap. Flow Combine and 11 bit studios’ challenging yet simple space trek is a stunning example of doing a lot with little. If you’ve ever loved exploring space and the idea of controlling a fleet of spaceships tickles your fancy, give Spacecom a shot, it deserves your attention. MU Online has opened pre-registration for Speed Event Server Season 2.